From this post, you can learn how to make Follow and Unfollow system like Twitter which you can create in PHP using Ajax jQuery Mysql and Bootstrap. There are many viewers has requested to use PHP to build a Twitter like system. If you know on Twitter can post short News in Tweets format, and that tweets will be visible to those Twitter user who has follow this share user. When user share any news or tweets, that will be visible to his followers. So, this type of system we will make in PHP using Ajax jQuery and Mysql Database. IF you are looking for any Social Networking Application for you colleage project, Then this post will help you to make small Follow Unfollow Application in PHP using Ajax step by step. On every publish of video tutorial of this post, you can find updated source code under this post. So, here we will show you How to develop twitter like follow and Unfollow system using Ajax in PHP script. Because most of this Social Networking sites are make in PHP Ajax. Here we have also use Bootstrap library for CSS purpose for make this system. 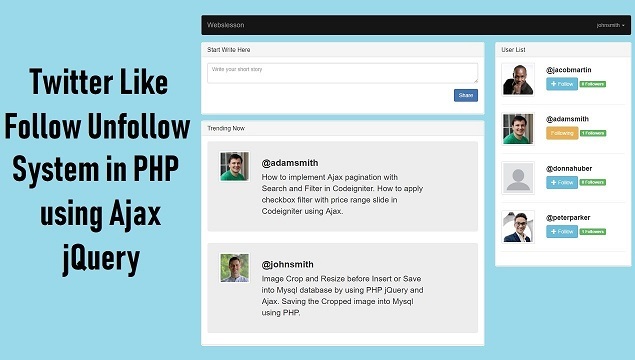 So, here we will make dynamic follow unfollow application in PHP using Ajax. Following are the main functionality of this follow unfollow system. So, Above are the main functionality of this follow unfollow system in PHP using Ajax jQuery Mysql and Bootstrap. Below you can find source code of Ajax based follow unfollow system. Run follow SQL script, it will make three table like tbl_twitter_user, tbl_samples_post and tbl_follow in your PHPMysqmin. Follow Unfollow system has been use this three table for make application. This PHP file is used for make database connection. This is common file which we will used in all files for make Mysql Database connection. For any dynamic web application, we have to first make register form. So, here also first we want to make user registration system. So, new user can register into system. So, for make any dynamic system, here we have make this register form. In this system, here we have validate username already exists or not. If username already exists then user cannot register into system. In this registration system we have also validate user password by re-entering password. So, this is basic validation, which we have use here for make registration system for Follow Unfollow system using PHP with Ajax jQuery Mysql and Bootstrap. Once you have make registration system in Follow Unfollow application. After registration you have to make login page for authenticate user login details like username and password. Here password will be validate by using password_hash() method. Because at the time registration we have store password in hash format. If user has enter proper details, then his for validate user is login or not in whole system, we have store user details under $_SESSION variable. If system is validated user information, and it is correct then page will be redirect to index.php page. From this page user can share his or her post. User can view his or her post along with post of follow user by login user. On index page user can view all user list with follow and unfollow button. Most of all operation of follow and unfollow system like post new post, comment on other user post, follow and unfollow other user, repost follow yser post will be done on this page. This page will be view to only login user. This file is used for make dynamic menu, here user name will be display by using $_SESSION varibale. Here in this we have add two menu for go to profile page and logout page. If user want to logout from dynamic follow unfollow application, so when user click on logout link then page will redirect to this page, and on this page all $_SESSION variable will be destroy using session_destroy() function. This file is used for edit user profile details in follow unfollow application by using PHP. Here user not only edit their profile details like username, password, name and short bio but also user can change profile image by upload image file under images folder. This image and user name will be display to other user. This file is used for perform all core operation of Insert Post, Fetch post data, fetch user data and make follow unfollow button in PHP Follow Unfollow system. This file will received request for all above operation. Remaining source code will be added very shortly. Demo doesn't work. It'll register me, but it won't log me in.